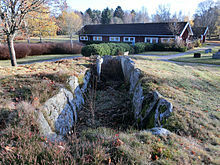 Gallery grave, missing a portion of its tumulus and all its stone caps, in a cemetery in Herrljunga, Sweden. 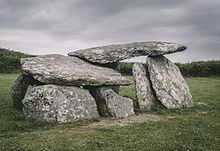 A gallery grave is a form of megalithic tomb built primarily during the Neolithic Age in Europe in which the main gallery of the tomb is entered without first passing through an antechamber or hallway. There are at least four major types of gallery grave (complex, transepted, segmented, and wedge-shaped), and they may be covered with an earthen mound (or "tumulus") or rock mound (or "cairn"). Archeologist T. Douglas Price argues that the gallery grave was a form of community burial site. Those placed in a gallery grave were most likely members of the same family or hamlet, and probably were intended to reinforce the sense of community. Gallery graves may be straight, or they may form an ell. In some cases, a burial chamber exists at the end of the gallery. The walls of gallery graves were built of orthostats, slab-like stones set upright in the earth. They were roofed with multiple flat stones, although the burial chamber (if one existed) was usually roofed with a single large stone. Multiple burials could occur all at one time, the grave could be reopened several times to accept new burials, or the grave could remain open over an extended period of time to accept multiple burials. 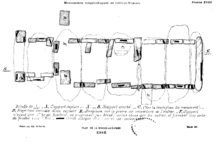 Drawing of the plan of the segmented gallery grave at La Roche-aux-Fées in France. Capstones (forming the ceiling) are represented by dotted lines. Burials in gallery graves were made in the gallery itself, or in small burial chambers opening off the gallery. This is known as a "complex gallery grave". When the adjacent burial chambers are paired, the structure is known as a "transepted gallery grave". Gallery graves may also have their galleries subdivided by interior stone slabs. These are known as "segmented gallery graves". When two parallel galleries lead to a single terminal burial chamber, this is known as a "parallel gallery grave". Some gallery graves were not rectangular in shape, but rather narrowed toward the rear. These are known as wedge-shaped gallery graves. The ceilings of wedge-shaped gallery graves often sloped toward the rear, and a sill of stone set some distance inside the away from the entrance or one or two slabs set upright in the earth defined a sort of antechamber. The wedge-shaped gallery grave was usually topped by a cairn (covering of stones) rather than an earthen mound (or "tumulus"), although an earthen mound was sometimes used. The cross-sectional shape of the cairn could be round, oval, or D-shaped, and often a kerb (ring of stone) was used to help revet the cairn and keep it in place. Some wedge-shaped gallery graves had curved rear walls, while others were linear. A few had the terminal burial chamber at the rear of the gallery, although this was usually blocked off. Wedge-shaped gallery graves sometimes had a set of outer walls. These could be parallel to the inner walls, or they could be set at an even stronger angle (emphasizing the wedge-like nature of the tomb). Wedge-shaped gallery graves usually faced west, and often had a pair of upright stone slabs linking the inner and outer walls at the entrance. The tumulus (or "barrow") covering a gallery grave may be ovate or long. The sides of the tumulus may be parallel or not. The tumulus was designed so that the end of the gallery (or the terminal burial chamber, if one existed) was at the center of the tumulus. A tumulus may contain several gallery graves radiating outward from the center. Since the earth atop the gallery grave was only loosely piled up, it often washed away due to erosion. Many gallery graves today lie exposed to the air, when originally they would have lain deep within a tumulus. Transepted gallery graves have burial monuments with side rooms extending laterally from a central chamber. They are found at sites in the Loire valley of France, south west Great Britain and in Ireland and it is thought the builders had cultural links with one another. A wedge-shaped gallery grave or wedge tomb is a type of Irish chamber tomb. They are so named because the burial chamber narrows at one end (usually decreasing both in height and width from west to east), producing a wedge shape in elevation. An antechamber is separated from the burial area by a simple jamb or sill, and the doorway generally faces west. A distinguishing characteristic of wedge tombs is the double-walling of the gallery. They were often covered by cairns, which could be round, oval or D-shaped, often with a kerb to revet it. More are low sized, usually about 1.5 metres high, and are generally found on mountainsides, about three-quarters the way up. Wedge tombs were built between the Irish late Neolithic and middle Bronze Ages (about 2500 to 2000BC). Today, between 500 and 550 known wedge tombs survive in Ireland, and are found predominantly in the west and north west of the island. 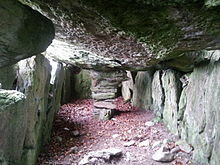 Along with the dolmen and passage grave, the gallery grave is the most common megalithic tomb in western Europe. Gallery graves were usually constructed during the Neolithic Age, which began about 10,200 BC and ended in Europe about 3,200 BC. Some, however, were constructed in the Middle and Late Bronze Age, about 2,300 BC to 600 BC. Dating of some gallery graves is difficult, as the tombs may have been constructed in the Late Neolithic or Early Bronze Age, but reopened and used for burials until the Late Bronze Age. The difference between a complex gallery grave and a passage grave (which also has smaller burial chambers opening off the main passage) is two-fold. First, the gallery grave gallery will be as high and wide as the side burial chambers, while in a passage grave the passage is not as high or wide as the burial chambers. Second, gallery graves are usually topped by a V-shaped tumulus, while passage graves are almost always covered by a round tumulus. Interior of Labbacallee, a wedge-shaped gallery grave in Ireland. ^ a b c d e f g h i j k Shaw & Jameson 1999, p. 247. ^ Daniel 2013, p. 9. ^ a b Price 2013, p. 185. ^ Daniel 2013, p. 70. ^ a b c d e f g Kipfer 2000, p. 598. ^ Barber & Altena 1999, p. 49. ^ a b c d Wilder 1924, p. 101. ^ Wilder 1924, p. 99. ^ a b c Roe 1970, p. 139. ^ Daniel 2013, p. 40. ^ a b c d e f g Barber & Altena 1999, p. 46. ^ Barber & Altena 1999, pp. 46-47. ^ a b Barber & Altena 1999, p. 47. ^ Chadwick, Fox & Dickins 2013, p. 9. ^ Chadwick, Fox & Dickins 2013, pp. 5, 9. ^ Wilder 1924, pp. 101-102. ^ BBC History (2004). "Irish Neolithic Tombs". Retrieved 2006-09-06. ^ iol.ie. "A Brief Guide To Irish Archaeological Sites". Retrieved 2006-08-26. ^ Price 2013, p. 184. ^ Piggott 1965, p. 61. Wikimedia Commons has media related to Gallery graves. Barber, Martyn; Altena, Jean François van Regteren (1999). European Bronze Age Monuments: A Multilingual-Glossary of Archaeological Terminology. Strasbourg: Council of Europe Publications. ISBN 9789287137128. Chadwick, H. Munro; Fox, Cyril; Dickins, Bruce (2013). The Early Cultures of North-West Europe. Cambridge, U.K.: Cambridge University Press. ISBN 9781107686557. Daniel, Glyn Edmund (2013). The Prehistoric Chamber Tombs of England and Wales. Cambridge, U.K.: Cambridge University Press. ISBN 9781107697621. Kipfer, Barbara Ann (2000). Encyclopedic Dictionary of Archaeology. New York: Kluwer Academic. ISBN 9780306461583. Piggott, Stuart (1965). Ancient Europe: From the Beginnings of Agriculture to Classical Antiquity. New Brunswick, N.J.: AldineTransaction. ISBN 9780202309392. Price, T. Douglas (2013). Europe Before Rome: A Site-By-Site Tour of the Stone, Bronze, and Iron Ages. New York: Oxoford University Press. ISBN 9780199914708. Roe, Derek (1970). Prehistory. Berkeley, Calif.: University of California Press. ISBN 9780520022522. Shaw, Ian; Jameson, Robert (1999). A Dictionary of Archaeology. Oxford, U.K.: Blackwell Publishers. ISBN 9780470753446. Wilder, Harris Hawthorne (1924). Man's Prehistoric Past. New York: Macmillan.